We never did tell the story of the night Max died. A few people have heard it. We thought some of the people who came to love Max in person and through this blog might find it helpful to read about it, just as we have found helpful to write about it. And so we share on the 2nd anniversary of his passing. Sunday Aug 31, 2008 – Max was in bad way. You could tell by the way he looked. It occurred to us at some point, probably after speaking with Dr. Sholler at 7:30pm (his breathing had changed significantly, becoming audible and clearly labored, about 75 minutes before he died), that his kidneys had shut down the day before. He was drinking lot of fluids, but never peeing. This, in addition to his belly being distended from the size of his liver, was causing him great discomfort. Earlier in the week we had found out that the neuroblastoma had spread to his liver and it was growing so fast you could almost see it. From Monday to Friday it went from regular to pressing so hard on his organs that he had to get palliative radiation to relieve the pressure. I think it helped a little bit – it at least stopped the rapid growth through Saturday and Sunday. As usual, Max was in an okay mood – considering the pain, discomfort, and morphine, which he controlled with a bolus button. He didn’t necessarily want to talk to anyone, but he let us sit and watch his programs with him, hold his hand, be at his beck and call. It was hot and humid (for us anyway) that late August. Max asked for his favorite – frozen lemonade which he ate voraciously. He smiled that pure, sweet, sweet smile of his. We, especially Andy, were there for whatever he needed. I don’t think Andy left his side for anything. We had made a bed on the couch for him so he would be comfy and still in the midst of the family action. We had scheduled Nicky’s 3rd birthday party this day. I think it worked out well… the whole family came to see Max, not actually knowing he would pass that very night. His cousins came in and sat with him for a few minutes each. I’m sure it was stunning for the children to see him look the way he did. It was stunning enough for the adults. Andy brought Max outside for a little bit for the party, but he was not feeling good (he was super light sensitive at that point and didn’t even open his eyes), and went back to the couch. I don’t remember much from the party to bedtime. There was a flurry of activity surrounding Max. His breathing at some point became wet sounding. I phoned Dr. Sholler and she instructed me to give him some of the emergency drugs we had from hospice, and told me “maybe 3-4 days.” He couldn’t get comfortable for anything when it was time to get to bed. He needed to sit up, he was floppy. So we decided to move him to our room and knew we’d be up all night. We propped him up on our bed with every extra pillow and I remember him adjusting his legs with his hands saying, “Why are my legs so heavy?” I phone my sister and asked her to come over to be with Hannah & Nicky during the night and the morning. We called hospice to have a nurse come and help us with Max and some meds. Once we thought he was set-up in the bed, he had to use the toilet. It was a struggle to get him there. In hindsight, it’s obvious that his body was slowly shutting down, but at the time we were living moment to moment and doing what ever we had to. Andy supported Max under his arms like he had been doing for a couple of days while Max had to use the toilet. Max went fairly limp and heavy, and I could tell that something happened. On the way back to the bed – Andy was carrying Max – he was heavy as lead. We laid Max on the bed, he was practically unresponsive. Andy & I were on opposite sides of the bed trying to help him, when he threw his head back, and his eyes rolled. We both called to him, “Max! Max!” His body jerked around a bit, and then he stared into the corner of the room like he saw something. It seemed like he was trying to talk, but no words would come and it was obvious that he wasn’t seeing us. We still called, “Max! Max!” And we may have realized at the same time that this was it. The tears started. Max was dying right here in front of us. Andy gained eye-contact with Max and through tears said, “Take Jesus’ hand Max.” And he closed his eyes, smiled and left us. 8:45pm. We brought Hannah in to say her goodbyes. Kids are so profound. She said through her tears, “He didn’t even lose a tooth.” Nicky was already asleep and oblivious to the night’s event until the next morning. My sister came a short while after and started making all the phone calls for us, as well as offering her calmness and prayers to our home. The hospice nurse came – we appreciate to this day the help she offered us that night. She helped us dress him in his favorite Clone Wars pants, his skull t-shirt that Tony Hawk liked, his skater beanie, and his flame high-top converse. He looked like Max again. All the swelling had left his face and body and he was beautiful again. Andy’s Dad and Aunt Joanne came by, and my mom and dad. Then we went to bed with Max lying between us. The small smile on his face stayed there until we laid his little body to rest. It’s so hard when you finally submit to giving up hope that your child will be cured. That the coming days are numbered and you’d better get all you can out of them. It was like a weight being lifted – and yet only lifted to reveal the suffocation of the pain you have to endure from then on. PS On a lighter note, please do NOT send Nicky to school today in the above photographed "outfit." What a precious gift. Devastating, but helpful to read. Thank you. Your family and all of Max's friends remain in our prayers. But prayer is not enough and so we join you in the fight. Max smiled. Wow. Very beautiful. The loss of your beautiful boy will break my heart forever. 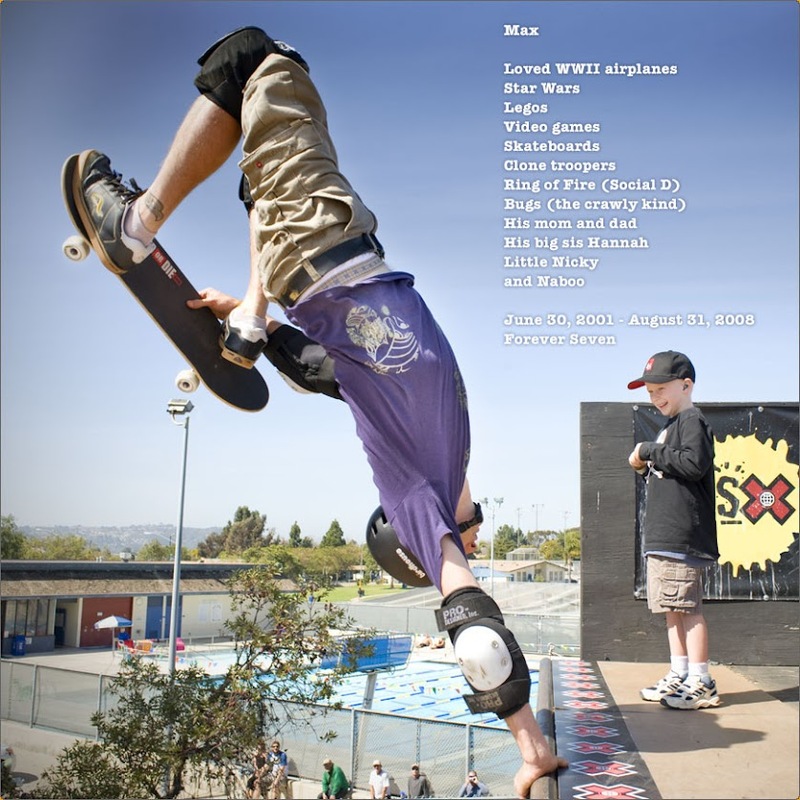 Max has touched countless lives near and far. Much love...extra prayers for Hannah and Nicky. I miss your little guy. Thanks Mel and Andy for sharing Max's last day. Such a heroic warrior and beautiful angel. - In God's hands. Thanking God for Max's smile. I am bawling reading this story...it is truly beyond heart breaking. There was something so very special about Max. I am still in awe at how a sweet boy I never met could make such an impact on my life. I still think about him all the time, especially at night when I look up at the stars and envision him off on some magical journey. It is hard to believe, when visiting this site and looking at pictures, that he is no longer here...and it is so hard to accept that a parent should ever have to face such pain and loss. I am sure it would have been easy to forget about cancer and move on with your lives, but instead you have taken an awful tragedy and used it to continue to do amazing work in the search for a cure, so hopefully someday you will help other cancer kids out there to lose their first tooth and reach the many milestones that they very much deserve. This post is the sweet and tender story of the end of Max's physical life here on earth. It is a gentle story of two loving parents and two loving siblings who gave Max a warm and safe place to be while he fought this long battle. It is the story of a family who will love him and remember him and treasure him always. It is the story of how important it is that Max was home and you were able to take care of him in his death as well as in his life; to bathe him, to dress him, to lie beside Max and hold him close one last time for as long as you wanted to, as long as you needed to hold him; one last earthly hug. It is the story of Hannah's good-bye to her brother and the love between the two of them, as well as, the trust, beauty, and honesty of your lives that would bring her to make such a wistful and poignant observation about her baby brother. I remember checking in on all of you like crazy two years ago knowing the devastation that was mounting and yet hoping that in some way my checking in would send waves of strength and love your way. I am still checking in and still hoping those waves of strength and friendship are reaching you, providing you with the knowledge that Max is not forgotten and that his peace and the peace of his loving family is still ever-present in our thoughts and in our prayers. Thank you for sharing Max with us. He is a beautiful child. Prayers with your family today. You are two wonderful brave parents and a true testament to your loving boy. Your post must have been so...so difficult to post and I thank you for sharing. My heart has always broken for your family when I first heard of Max and you guys to actually meeting you at Touch a Truck. I pray for you always. Thank you for all you continue to do for the NB warriors. God bless your family always and we will see you out on the front lines of raising money for a cure! Call on us Inman's anytime, and we will be there to help support. See you at the next event, which we are planning on attending. Max we really wished we could have met you and we ask for you to watch over our kids fighting this disease from the heavens. Max your memory and spirit lives on. Thank you for sharing... Although, in hindsight I probably shouldn't have read that at work. God bless you all today and always, thank you so much for all you do... from sharing Max and your story to fundraising for a cure. Maxies passing and I couldnt stop the tears until I could write and let you know of the sadness we feel for you and Hannah and Nick. He touched all of our hearts in ways we can only imagine. He is still there and will always be a part of our lives. I carry a couple of pictures in my wallet and see him every day and still hope that he will somehow appear and say a few words to me. He was a lovely little man who I know would have made himself into a fine young man. I follow your blog after somehow getting here months ago after Layla Grace's passing. Max and another little child, Lucas, seemed to have been such special children. I was heartbroken to read this post. I always wondered how and why he passed so suddenly. He was so happy eating his iced lemonade. Know that some stranger out there in Hoboken, NJ often thinks of your little one while lying in bed at night. I always think of his smile. Thank you for sharing your last moment with Max. It must have been such a relief for Max that the final departing place was between his mommy and daddy, on their bed, and not on a hospital bed. Such a wrenching experience for you, though. No words can describe the grief of parents who have to watch the life of their child slip away right in front of their own eyes....My thought and prayers are with you all. I have followed Max's story for quite a while. He has the same birthday as my lovely daughter, and he died on the same date as my wonderful mother. I think of him often as I volunteer at a local Ronald McDonald House and I hope that what I do there, baking cookies, playing board games, simply listening, helps children like Max, even just a little bit. He touches my heart. Melissa and Andy, as usual, I come to your site and I end up in tears yet profoundly touched by your ability to verbalize things I cannot and do not want to ever imagine. You continue to honor and share Max in ways that touch people in ways you'll never imagine. Thank you. We hold you you in our thoughts and prayers every day. As always, I am brought to tears--flooded with memories of Max, and overwhelmed by what you went through. What a beautifully written and touching account of Max's last night. I read it through my tears and it's so true - you need to grab each moment you can with them once you realise there's no way they'll beat the illness. My heart goes out to your family. Thankyou so much for sharing your story. Love Stephanie. Again, I am a reader and have loved Max and your family from afar for some time. I remember right before Max passed away I had colored a pepper at Chili's and wrote "Max You're MY Superhero", only to sign online the next morning, maybe 10hrs later to see he had passed away. Please know in all of these following months and even just last week I went back to Chili's and made the same pepper, just for your boy. Love to your family, Always. You are beautiful people who deserved so much more time. Max was special, thank you for sharing him. Despite not having enough time, he's changed the world for the better. As a mom, my heart just aches for you, and rejoices at the same time, for the way you proudly present him to the world. Your family is inspiring and incredibly strong. You honor your Max. He must be so proud of you. Thinking of max today. What a sweet boy. Five years, and I'm still devastated. I miss his beautiful smile every day. I'm glad, though, that Jesus was there to take his hand. God bless.